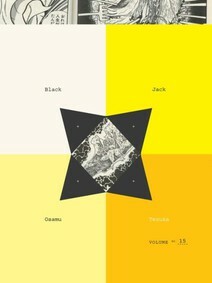 Volume 15 contains fourteen of Black Jack's many worldly adventures... A Life to Live: Black Jack is called in to treat a young flower arrangement master. The talented artisan is suffering from acute porphyria which is impacting her digestive and nervous system. Given her current condition she cannot even stand to be in sunlight; as it often induces fainting spells, hallucinations and seizures. For an artist who focuses on light and life, to not be able to use sunlight to bring life to her art the ikebana master almost believes she has no life to lead. However with every new piece that she creates there is no doubt to her mentors that life itself is worth living. And if she survives she might have a life-changing decision to make about her career. A Star is Born: In a rare chapter where Black Jack does not perform an operation, the good doctor must treat a previous patient's heart and soul. Award-winning actress Igusa Suginami says she owes all her success to the treatment she received from BJ years ago. Since she had her operation she feels she has been blessed by a god of luck and is now ready to embark on the biggest performance of her life...She wants to confess her feelings to Dr. Black Jack. Sadly the doctor does not recognize Igusa the superstar. He says he treated Chika the young singing talent with ambitions of making it big with her skills. Their reunion does not appear to be destined as the next big romance; instead it might end up becoming a tragedy for the ages.